Enjoy the taste of sugary sweet, carnival-style cotton candy with this Big Train cotton candy frappe mix! With a name symbolizing strength and constant motion, Big Train has expanded into a global foodservice brand you can trust with a large number of diverse products to choose from. Big Train has become a leader in the specialty beverage mix industry, delivering easy-to-make and consistently-delicious products. 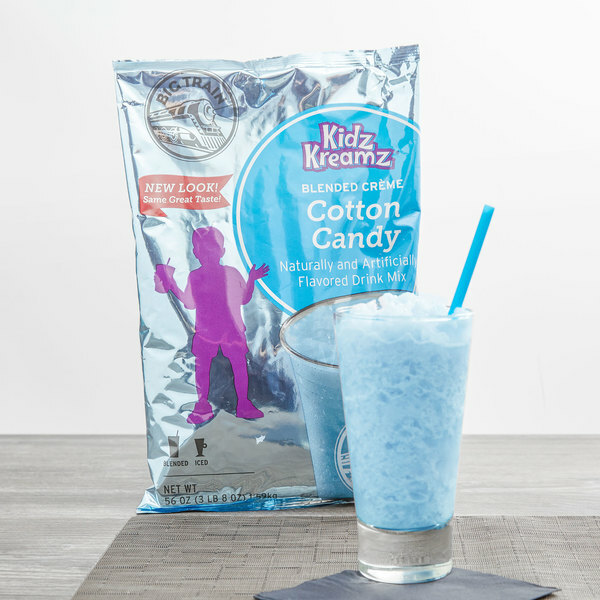 Kids especially will go crazy for the dessert-like Kidz Kreamz specialty drink mix. Featuring classic, flossy, light cotton candy flavor, this drink mix isn't only a tasty treat for kids, but grown-ups can rest assured that it's low in fat too! In fact, it's also caffeine free, gluten free, trans fat free, and contains no hydrogenated oil. This specialty drink mix also makes a fun alternative for grown-ups who do not prefer coffee. A powder that makes creamy and indulgent drinks, this mix is perfect for sprucing up the menu in your coffee shop or cafe. Offer profitable drinks and satisfy your patrons' cravings for something sweet and new. Better yet, they're easier than ever to make! This cotton candy frappe mix can be enjoyed frozen, hot, or blended. Create a fun, innovative cotton candy-flavored milkshake without needing to supply the ice cream, or treat your guests to a unique spin on hot chocolate with cotton candy flavor. For a 16 oz. blended drink, blend 5 oz. of chilled coffee, water, milk, or dairy substitute with 2 scoops of Big Train Mix and 12 oz. of ice. For an 8 oz. iced drink, combine 1 scoop of Big Train Mix with 7 oz. of water in shaker. Shake for 30-60 seconds, pour over ice, and serve. We use this brand's cotton candy, orange cream, and bubble gum flavors but the cotton candy flavor is the best hit among not only children but adults as well! I myself am a huge fan of this flavor since I do not drink caffeine. It's not too sweet but has a good balance to achieve that cotton candy flavor and sweetness everyone looks for. Bought several flavors of Big Train mixes and this one is my kids favorite. The mix blends easily and taste just like you are drinking a cotton candy at the fair. Great product! This was a huge hit at my cafe over the summer! It tastes exactly like cotton candy, but not overly sweet. It's a pretty pastel blue color. We called it a Cotton Candy Frappe- iust blend with milk & ice! Took a photo of this prepared drink with whipped cream and colored sprinkles on top and posted it on social media and got so much attention! Very sweet and great response from kids. This product smells great and has a nice color. The taste is very subtle so we end up using more that is recommended so the taste comes through. We currently use it as a milkshake flavor, it mixes very well with the ice cream and milk. The kids love it! Kids (and adults) love this flavor! Tastes just like cotton candy. This is a great product with a great taste and so easy to make. This big train cotton candy mix was exceptionally tasting and to beat it all it’s caffeine free. While blending it turns into a beautiful almost Bermuda blue color and tastes amazing topped with whip cream! Our kids love it and we can’t wait to make our second purchase of the mix! Product was very tasty! Blended well and was a very pretty blue color. Will definitely be ordering it again. Customers really liked this flavor drink mix. The kids have really enjoyed this product. It has good flavoring and mixes well with milk. It makes a good shake. I will continue to purchase this product. Tastes more like vanilla than cotton candy but we had some blue raspberry syrup and added it and it tasted more like cotton candy. Pretty color! This is a very popular flavor at my store. It is very good. Big train is a great product and is very easy to make. This has a great flavor, the kids love us offering this in our coffee shop and seeing their big eyes when they get this blended blue drink topped with sprinkles is great! A wonderful and unique play on a carnival favorite. The cotton candy frappe mix is sweet and tastes just like cotton candy. A favorite among kids and adults alike. Our most popular frappe mix and definitely the best tasting one we serve. Adults and children love this flavor. Top with whipped cream and cotton candy crumble and you have a masterpiece. OMGoodness!! what a treat. I'm not sure if my grandchildren will ever get any! This flavor is something that I can't find in the small town that I now live in. Be still my childlike heart! Not only is the cotton candy frappele the number one favorite among the children...my adults love it just the same..take a gamble and add espresso to it! The Big Train Cotton Candy Frapp is a huge hit in our shop! We really needed something to offer our customers kids and this turned out to be amazing! We even have several adults who just love the real Cotton candy flavor! Cotton Candy is a favorite for our customers. 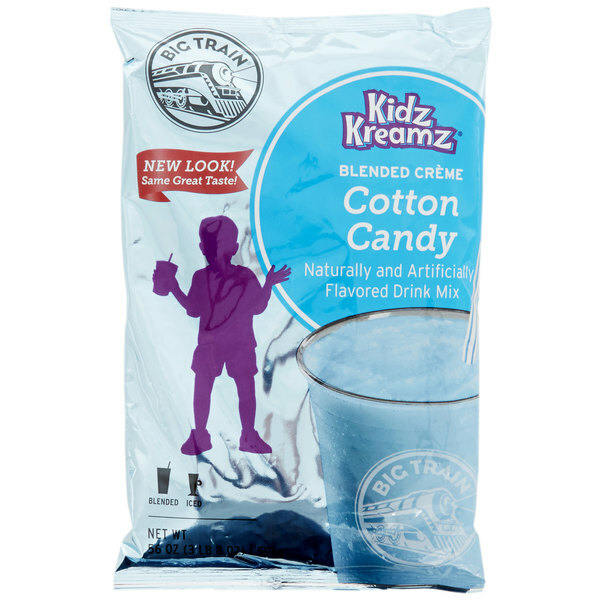 Big Train Cotton Candy Kidz Kreamz Frappe Mix - 3.5 lb. is perfect for making our yogurt, we can never run out of this. I love the Big Train brand mixes and our customers do too. The Cotton Candy is a big hit with the kids, and the adults often want to try it too! Great for kids and adults are loving it too. Extremely sweet and has gone over well for summer and with non coffee drinkers and children that come in to our shop. Superb quality from Big Train!! These flavored powders can be used in a variety of ways for many different drinks. Our kids love for us to make them Cotton Candy milkshakes. This is the closest you can come to getting that Cotton Candy flavor that is not overbearing. You don't have to use much product to make that creation and it lasts a really long time. We love all the different flavors they offer. I was skeptical at first about buying cotton candy flavor but i still wanted to try it out for my younger customer base. I am so glad i bought it because its actually really good. We bough this mix to test out new flavors in our shop; the flavor and texture came out almost perfect! We also ordered the bubblegum flavor, but the cotton candy was a bigger hit with the kids. We were also impressed by the high-quality ingredients the powder was made with.